Sometimes I sit down to write a post thinking I know what I’m talking about and then as I write and check the facts I thought I knew, I realize that I was completely on the wrong track. In March 1963, Howard Memorial Hospital was built at 1550 Lafayette Street overlooking Back Bay. The 5th floor was added in 1975 to increase bed capacity to 200. January 15, 1985, site preparation was initiated on the multi-million dollar replacement facility at 150 Reynoir Street in downtown Biloxi. Patients were moved to the new facility October 13, 1986 and dedication ceremonies were October 26, 1986. As you can see from this aerial of the current hospital, there should have been no way I could have mistaken one for the other, but that’s what happens when you make assumptions. THIS is a 150-bed general hospital with all service facilities designed to accommodate a future addition of another floor containing 48 beds. Constructed principally of reinforced concrete and masonry, this hospital has an exterior of light buff brick and aluminum window wall units. Wide concrete canopies protect the main entrance and the emergency ambulance entrance. The various services that are the heart of the hospital, including surgery, labor and delivery rooms, laboratory, X-ray, emergency department and an intensive care section, are grouped conveniently on the first floor. Patients’ rooms are on the second, third and fourth floors; the second and fourth each containing 48 beds (24 private rooms and 12 two-bedrooms) . The third floor contains 40 beds and 4 nurseries to provide care for 34 babies. 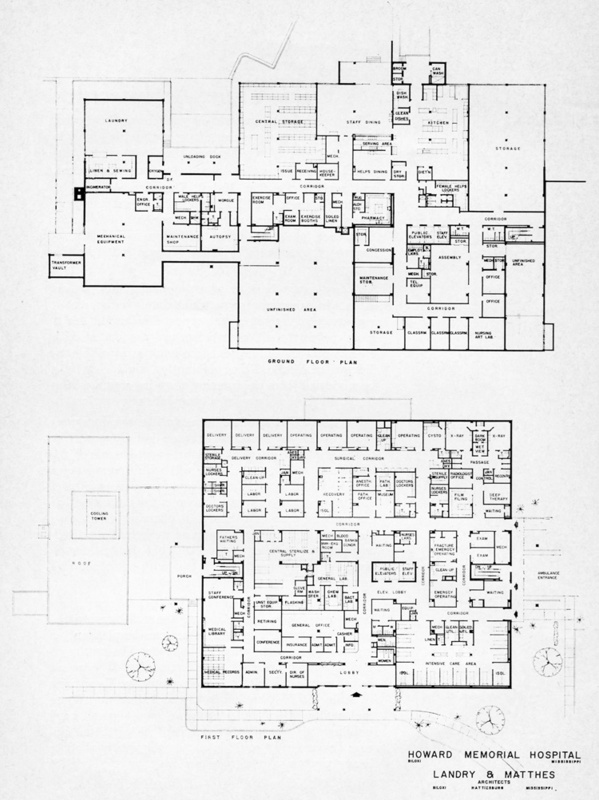 A nurses training section, general storerooms, laundry, cafeteria, kitchen, drug stockrooms, physical therapy, morgue, autopsy room, maintenance shop, boiler room and mechanical equipment all occupy the ground floor. 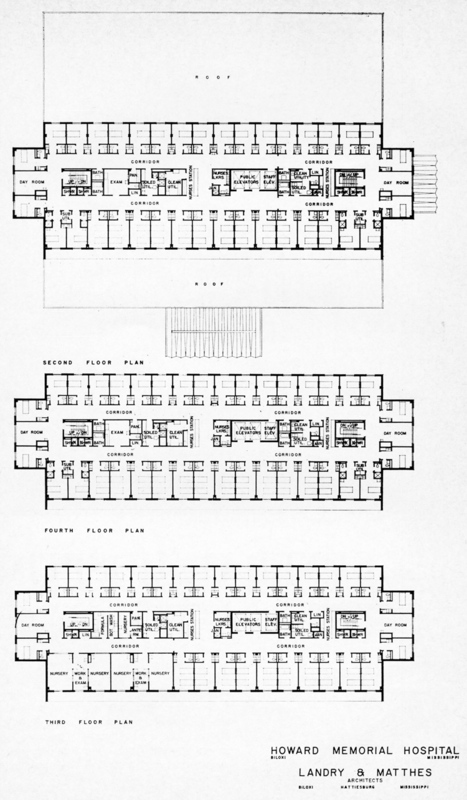 This article is reprinted from the April 1964 issue of the Mississippi Architect, with permission from the Mississippi Chapter of the American Institute of Architects. To view the full April 1964 issue of Mississippi Architect in a digitized format, or other articles in this ongoing series, including the pdf version of each full issue, click on the MSArcht tab at the top of this page. ‹ Mississippi Architect, April 1964: Say No To Historicism! Great post! 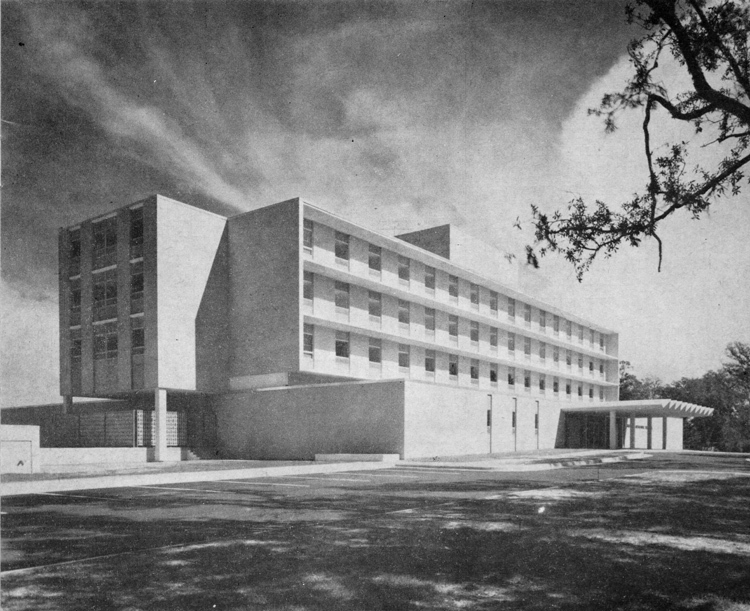 I have seen the photograph of the hospital used in a 1960’s era city of Biloxi directory. Does Mississippi Architect give a photo credit to anyone? Its bizarre to see photos of downtown Biloxi after the urban renewal project but before the hospital was built. It looks like a big empty hole in the middle of downtown. Very interesting. Does anyone know if Howard Memorial on Lafayette Street is still in operation? I worked for Taylor and Associates, Consulting Engineers, and designed the mechanical systems for that facility. Bill Adams, Electrical Engineer, and Post & Witty, Structural Engineers, were the other consultants on this project. Working with Landry & Matthes and the other consultants on this project was a real pleasure. Since 1996 the former Howard Memorial of Lafayatte Street in Biloxi has been used as a State of Mississippi office building. Thank you for sharing your knowledge of the project and giving us your insight on working with Landry and Matthes! Did you work on other projects with the Landry & Matthes or work with other firms in Mississippi?